064. THE "QUEST." Issued by Carreras Ltd. (1929). It is card number 19 from a set of 25 cards entitled "Notable Ships Past & Present". Size: 2.7" x 1.42". 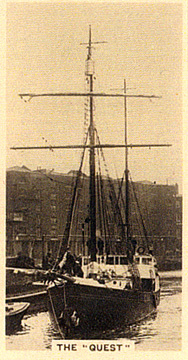 Recto: Photographic view of the Quest probably on the Thames in London. At bottom: The "Quest".